9ct yellow gold ruby ring featuring stunning diamond set shoulders in a twist design. 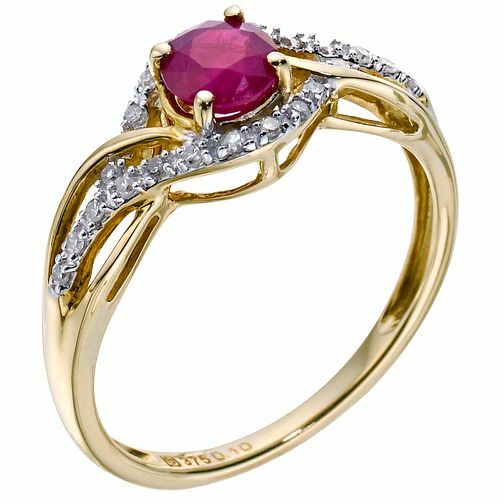 A delicate ring with a stunning vibrant ruby carefully set in four claws of yellow gold. 9ct yellow gold ruby & diamond twist ring is rated 4.4 out of 5 by 5. Rated 5 out of 5 by Anonymous from Ruby anniversary present This ring was just right as a present to mark our ruby anniversary and it is a beautiful ring. Rated 5 out of 5 by Anonymous from Lovely ring, better than pictures! ordered the ring as a gift and it did not disappoint! lovely finish, very happy wife!